Get the Pathfinder 9'9" inflatable SUP at a great price by visiting Amazon.com! The PathFinder 9’9” Inflatable Standup Paddleboard is a versatile SUP board that was built to be durable. As the name pertains, the board is 9’9” long and five inch thick. It was designed to be used in a wide range water conditions. The package comes with iSUP board, high-pressure air pump, bungee tie-down, valve wrench, carry bag, aluminum paddle, and a removable center tracking fin. When deflated, it can easily fit inside the small carry bag that makes it portable and easy to store. It feels like a hard board when it is fully inflated. Very Durable – the iSUP is made of high-quality PVC material and craftsmanship. Rigid Construction – the PathFinder 9’9” is made to be rigid. When inflated to up to 15 PSI, it is as rigid as a hard board. It is 9’9” long and 30” wide with a thickness of five inches. It can carry up to 240 pounds. 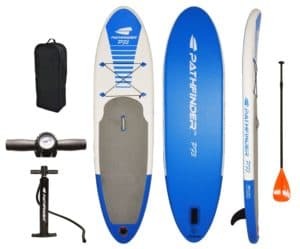 All-in-One Package – aside from the inflatable standup paddleboard, the package comes with a lot of extras that you need to inflate it that include an aluminum paddle, air pump, carry bag, removable fin, and a valve wrench. It also features a bungee system and D ring that allow you to secure your cargo. Portable – the paddleboard can easily deflate, roll up to a small size, and fit into the carry bag, along with the air pump and all the extras. The bag measures 35” by 21”. Consumers who bought the PathFinder 9’9” Inflatable Standup Paddleboard have mostly good and just a couple bad things to say about the product. Below are some of the pros and cons about the iSUP based on customer feedback. The PathFinder 9’9” Inflatable Standup Paddleboard got 4.5 out of 5 stars rating on the Amazon marketplace. It is a flexible iSUP that has a solid build and an above average weight limit. It is recommended for families who are looking for a versatile inflatable standup paddleboard that can be used in a wide range of water conditions. Although it is not as stable as other iSUP on the market, it is a good starter paddleboard for people who want to try out the activity.